If the falling leaves, cooler temperatures, and pumpkin-flavored everything hasn’t tipped you off yet, the spooky decorations, fake cobwebs, and candy are all clues that Halloween is just around the corner. Sweet treats are one of the best parts of Halloween, especially for kids, but is it possible to enjoy Halloween candy while still avoiding cavities? Halloween might actually be an ideal time to teach children good oral health habits without completely depriving them of their sugar-coated joys. The dentists at Dakota Dental believe that teaching some simple lessons in moderation and explaining how tooth decay happens will go a long way to helping kids learn the importance of dental health. After kids get back from trick or treating, have them all sit down and go through their bags of candy. Next, choose a number and let them pick out that amount of candy from those they want the most (be sure that amount is appropriate for their age). Then, the rest of the candy goes out of sight – either freeze extra treats for another time or maybe give them away at work. Letting your kids pick out their candy not only limits the amount of sugar they have, but it also teaches them that while having some candy isn’t bad, it’s the excess of sugars and starches that can lead to oral health problems and cavities down the road. 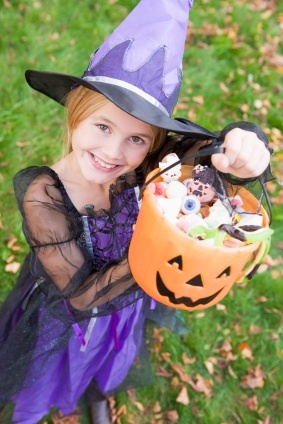 With their candies chosen, designate a “treat time” for kids to eat their candy. This helps promote the idea that eating sugary snacks isn’t an all-day thing and helps them understand when they can look forward to their treat. Lastly, make sure that kids know how to clean their teeth and schedule their brushing to be shortly after their snack time. The family dentists at Dakota Dental know that it isn’t fair to completely deprive kids of candy, especially around Halloween. But teaching kids about preventive dental care and the long-term benefits of having healthy teeth can go a long way to a lifetime of healthy habits. For more tips on how to clean your teeth or other good oral health practices, contact Dakota Dental today.